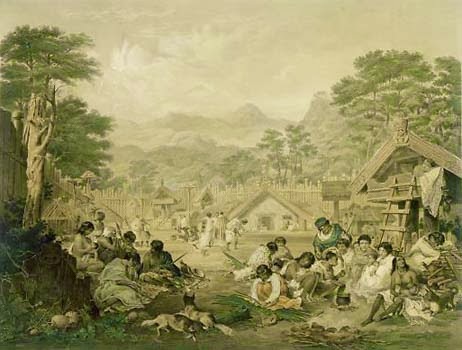 New Zealand Art Print News: Early Prints of Maori Life : John Gilfillan's remarkable "Interior of a Native Village"
Early Prints of Maori Life : John Gilfillan's remarkable "Interior of a Native Village"
Part of an occasional series of articles on prints from our collection. 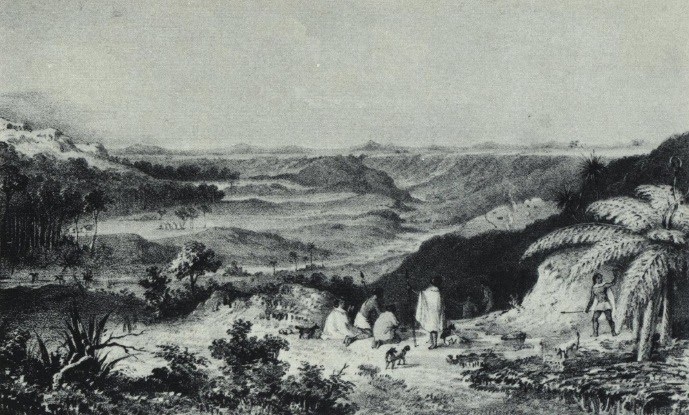 This week we look at the tragic life of the artist John Gilfillan whose depiction of a pa on the Wanganui River "Interior of a Native Village" is both a remarkable portrait of Maori life in the early days of colonisation and one of NZ's rarest prints. John Alexander Gilfillan, the son of a Captain of the 78th Highland Regiment, was born in 1793. He ran away to sea at an early age, but later retired from the navy to study art. Gilfillan's qualifications gained him the position of Drawing and Painting Master at the Andersonian University, a position which he held for fifteen years. In 1826 he married Miss Sarah Murray, by whom he had four children. She died in 1837, and shortly afterwards he married his cousin, Mary Bridges, and moved with his family to London, where he spent three months studying carpentry and engineering in preparation for emigrating to New Zealand. The family arrived in New Zealand on Christmas Day 1841 (Gilfillan's 47th birthday) and went immediately to Petre (Wanganui). They took up land at Matarawa (Mataraua), and built a house on their town section, living there till 1845 when they moved finally to the farm. This house was illustrated from a sketch by Gilfillan in W. Tyrone Power's Sketches in New Zealand. The murder of Gilfillan's wife and three of his children on 18th April 1847 caused him to abandon his farm, and at the end of the year he moved with his remaining children to Sydney. During the fifteen months he lived there he painted the Interior of a Native Village. The Pa is reputed to be Putiki-whara-nui on the Wanganui River. Gilfillan moved to Adelaide in 1849, but in 1852 was tempted to the goldfields, and afterwards went to Melbourne. He exhibited paintings at the 1854 Exhibition, and died in Melbourne in 1863. The authors of Early Prints of New Zealand were indebted to L.A.L. Moore, Esq., of Wellington for the following account of the circumstances surrounding the printing of the lithograph of Interior of a Native Village. Mr Moore's grandfather, Captain Frederick George Moore, was in the merchant marine, and arrived in Wellington in February 1840 aboard the Bengal Merchant. He purchased the brigantine Jewess and began trading round the New Zealand coast. He acted as pilot for Wakefield's ships the Will Watch, Whitby, and Arrow when they sailed into Nelson Haven to establish the second New Zealand Company settlement, and himself settled on property at Motueka and in Nelson. Moore probably first met Gilfillan in Wanganui during a trading visit, but met him again in Sydney in 1848 when he (Moore) was on a return trip to England. Gilfillan gave the painting of Interior of a Native Village to Moore, who took it to London, and on arrival arranged an interview with Prince Albert to see if the painting could be displayed at the Royal art gallery. The picture was inspected by both Prince Albert and the Duke of Wellington, and it was decided that it should be shown at the 1851 Exhibition at the Crystal Palace. Captain Moore was in charge of the New Zealand Court at the Exhibition, and the picture was among the items included. Moore had 50 copies lithographed, sending 25 to Sir George Grey for distribution, and selling and presenting the remainder to friends and associates in London. After the Exhibition, Moore gave the original painting to his sister in Paris: all trace has been lost since the 1870 Franco-Prussian War and it is possible the picture was destroyed at that time." It is interesting to note that all known copies of the lithograph bear the word "Proof”. Moore may have perhaps intended to issue the lithograph in larger numbers once the initial fifty were distributed. A census of copies would be interesting today: if in fact only 50 copies were printed, natural wear and loss would reduce the quantity to a handful, making the Interior of a Native Village one of the more rare New Zealand prints. [The print was reproduced by Avon Fine Prints Ltd, Christchurch, 1969 in an edition limited to 1000 copies, NZ Fine Prints have a handful of prints from this later edition available for purchase].